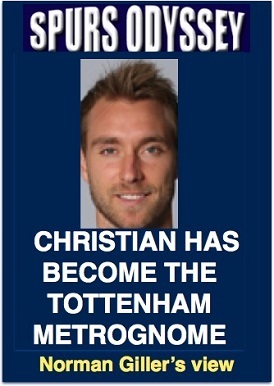 Christian Eriksen was the only Tottenham winner at Southampton yesterday � by not being there. The Dainty Dane was so conspicuous by his absence that even his harshest critics began to realise just how important he is at the heart of the Spurs team. He gives the side their pattern and precision with passes that are always thoughtful and designed to feed the likes of Harry Kane, Dele Alli and Son Heung-min, and to help them unlock the gateway to goal. He is the metronome � or dare I say metrognome � that provides the rhythm and tempo of the team, and he has become as vital and influential a part of the Spurs engine room as his great predecessor Luka Modric. It is crucial that Eriksen is fit for the upcoming challenges in the Premier League against Man United (home, January 31), Liverpool (away, February 4), Arsenal (home, February 10) and then the fairly important date with Juventus in Turin on February 13. We should be able to get by without Eriksen for the FA Cup fourth round visit to Newport on Saturday. A dicky bird told me that the virus that knocked out Christian and skipper Hugo Lloris yesterday had several other players feeling wobbly before the journey to Southampton. There was blistering criticism of the Spurs performance on line by one-eyed fans who could not bring themselves to give the Saints credit for a spirited display that was well worth a point. The strength-sapping conditions were appalling and a great leveller, and Tottenham without their navigator Eriksen lost their way as Southampton packed their defence and concentrated on incisive counter attacks. Our guru Paul H. Smith braved the wintery weather and gives his eyewitness account of the match HERE. I am not getting involved in all the gossip about the comings and goings in the transfer window. The only situation that concerns me is the Real Madrid manager/coach job, with Zinedine Zidane suddenly on rocky ground. It is obvious that Real will turn to Mauricio Pochettino if they decide to wave adios to Zidane, and that is one offer I am convinced Professor Pochettino could not refuse; and you can bet your boots he would try to take Harry Kane and/or Dele Alli with him. I just hope it�s all wild speculation � and I also hope that those myopic fans who want to see the back of Pochettino will start trying to make him feel welcome. For my money, he is the best overseas manager Tottenham have ever had, and it would be crazy to drive him away. I stirred up a hornets nest last week with my assertion that Harry Kane and Son Heung-min are as good as any Tottenham attacking double act since the golden days of the G-Men,Jimmy Greaves and Alan Gilzean. Let the arguments begin. Disagree with me and I will give it to you with both barrels! WEEK 23 of the Sports Odyssey Quiz League 2017-18. The rules are simple: I ask one Tottenham-related question for which a right answer earns you two points, and then a related teaser that can bring you an extra point. Who captained his country 42 times while winning 59 caps and joined Spurs from Coventry City? With which club was he a League championship winner? Please email your answers by Friday�s midnight deadline to: soql23@normangillerbooks.com. Question 22 was Which Yorkshireman won 21 England caps while with Tottenham, and which manager brought him to White Hart Lane from Leeds? More than 60 were spot on with this one: of course, Aaron Lennon, who joined Spurs from Leeds United for a give-away �1million in 2005. Martin Jol was manager. I was moved by the standing ovation Lennon received when coming on as a substitute for Everton at Wembley recently. This was Spurs� fans at their warmest and most welcoming. It looks as if he could join Burnley this week. He always gives 100 per cent regardless of the colour shirt he is wearing. First name drawn from the correct answers: Colin Davies, of Cardiff, who has been a Spurs fan since his schooldays in the 1960s. I will send Colin a screen version of my Spurs �67 book (I have now sold all copies, and the book raised �4,000 for the Tottenham Tribute Trust to help our old heroes Thank you all those Spurs Odyssey followers who gave their support).